In 1830, the same year of the Uruguayan Independence, Juan Manuel Blanes is born. He devoted himself to realist paintings, portraying historical events of his country and its neighbor, Argentina. 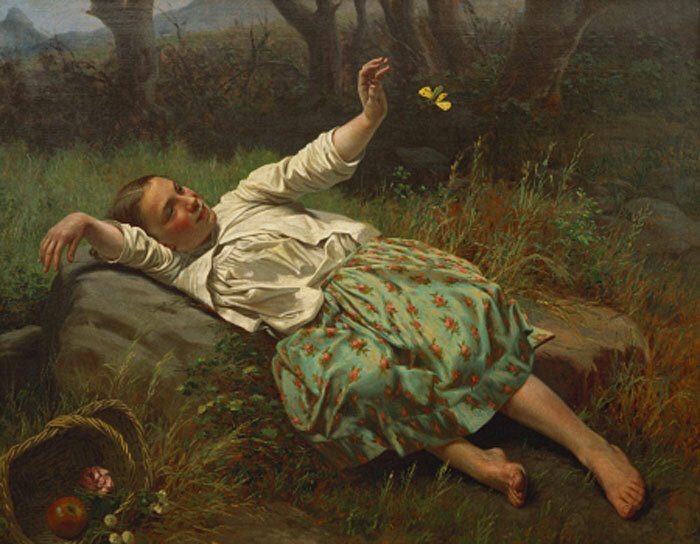 His work Paraná landscape shows us a laying peasant on a rock playing with a butterfly. On the background, we see the vegetation typical of the bank of the river Paraná. This painting is often interpreted according the historical moment Uruguay was going through: their recently gained independence. The dreamy attitude of the girl gives us the impression that she is imaging a better future. The new direction of his country, the change, is represented in the painting by the butterfly. ~ by Álvaro Mazzino on August 25, 2010. Your papers were still in utter disarray, but they were in disarray in one place, a pretty place, where a psychedelic marine mammal kept them safe. вашем блоге из браузера опера у меня возникает ошибка, а если зайти с maxthon то работает, почему так происходит? We get a first look at the Nike Air VaporMax Strap Olive colorway that features a Primeknit upper, Black strap displaying a White Nike Swoosh logo. This entry was posted on August 25, 2010 at 09:07 and is filed under Realism.You can follow any responses to this entry through the RSS 2.0 feed.You can leave a response, or trackback from your own site.